Are you stuck giving the dreaded weekly spelling test? You know- the one where a few students can already spell all the words on Monday morning and a few others can barely spell any on Friday afternoon and the carryover into written work is hit or miss for all. Although weekly spelling tests are an educational institution, around when I was a kid and apparently still a common approach to teaching spelling, it’s a one-size fits all approach when the kiddos in your classroom come in all different sizes, each with unique learning needs. Twenty years ago, more or less, I was introduced to the word study approach to spelling. (For great introductions to this approach, see these posts by Reading Rockets and This Reading Mama.) I had the opportunity to take a class from Kathy Ganske, who subsequently authored Word Journeys and Word Sorts and More.I fell in love with Ganske’s Developmental Spelling Analysis (DSA), A Qualitative Measure for Assessment and Instructional Planning. I implemented it that year and continued to use it until the day I retired! Needless to say, this is one of those resources I have which is being held together with a rubber band. The DSA has two forms and can be given at periodic intervals throughout the year. It can be administered to an individual or a group. It follows the same stages of spelling (letter-name, within-word pattern, syllable juncture, and derivational constancy) found in Words Their Way. Unlike other developmental spelling inventories I’ve seen, it includes five words for assessing each feature in each stage. Examples of letter-name features are single consonants, initial consonant blends and digraphs, and short vowels. It’s a wonderful tool for providing qualitative baseline data and for measuring growth across time for all children. This is also an assessment which easily lends itself to writing annual I.E.P. goals (i.e. The student will demonstrate mastery of at least 4 features of the letter-name stage of spelling by June 1, 2017, as measured by the Developmental Spelling Analysis.) or whatever data-driven goals may be required in general education. The word study approach to spelling is a fabulous way to include all students in a general education classroom. Every child can be completing the same or similar activities using their weekly words, which are based on a diagnostic assessment and a progression of developmental spelling skills. 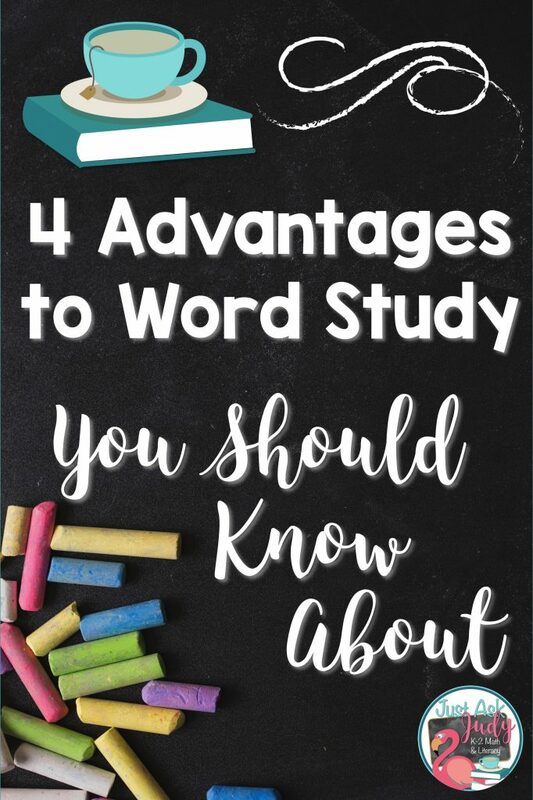 Word study is an implicit and analytical approach to instruction. Some students will require more explicit instruction for both encoding and decoding, which is often provided in an intervention or special education setting. Word study dovetails nicely with the progression of skills in explicit and synthetic phonics approaches, including Orton-Gillingham. I created six free letter-name and within-word stage jelly bean sorts for you. Each sort has 12 to 16 words and pictures for two or three features. These are perfect for providing a little bit of seasonal skill reinforcement, with Easter just around the corner followed by the unofficial National Jelly Bean Day on April 22nd. Choose the sorts that best fit the instructional needs of your learners. These sorts can be completed in several different ways. 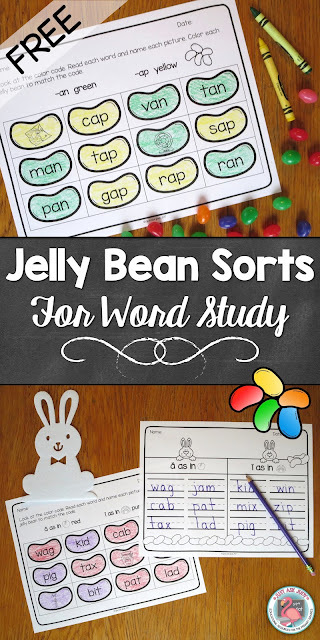 Your students can simply follow the code to color each jelly bean word. They can also cut out the words and physically sort them by features. They can write the words on the sorting page, a whiteboard, a piece of paper, or in a word study notebook. Each sort has also been designed so that the colored jelly bean word cards can be cut out and used to make a repeating pattern. 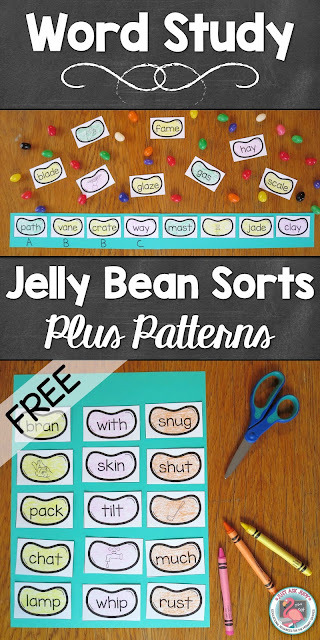 Your students can simply create the pattern or they can glue the jelly beans onto paper or a sentence strip. 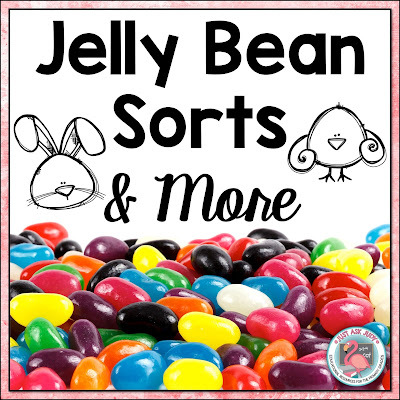 Jelly Bean Sort- Addition Fact Strategies is an open-ended resource, available for purchase in my TpT store, for sorting addition facts to 20 by mental strategies. You choose the strategies your first and second-grade learners need to practice or review. Jelly beans are the perfect “treasure” to use with this free kindergarten and first-grade resource. Again, jelly beans are the ideal “treasure” to use with this free first and second-grade resource. Check out this place value post for more information about using this activity. One of the themes included in this resource for kindergarten, first, and second grades is jelly beans. This resource for first, second, and third graders includes a data collection and graphing activity with a jelly bean theme. This is not your typical jelly bean graph. My Joy-Filled Life shows you how to create an easy Tic-Tac-Toe Easter Treat for even more jelly bean fun! Check out what other Special Ed bloggers have to share! I love the jellybean word families! Thanks!